Love is over. Hope is dead. Mitsubishi may revive the name of its beloved Eclipse sportscar to slap on yet another dull crossover, reports Autoblog. Nothing even matters anymore. The world is pointless. Every day is silent and grey. Come Armageddon, come. Mitsubishi teased their new bowl of slightly warmed porridge today, which will fit somewhere between the Outlander Sport and the larger Outlander in terms of size. Per Mitsubishi’s announcement, the new crossover features a more steeply raked rear window, a wedge-shaped beltline and a longer wheelbase that only has a short overhang in the rear. It sounds pretty inoffensive, so long as they don’t call it an Eclipse. 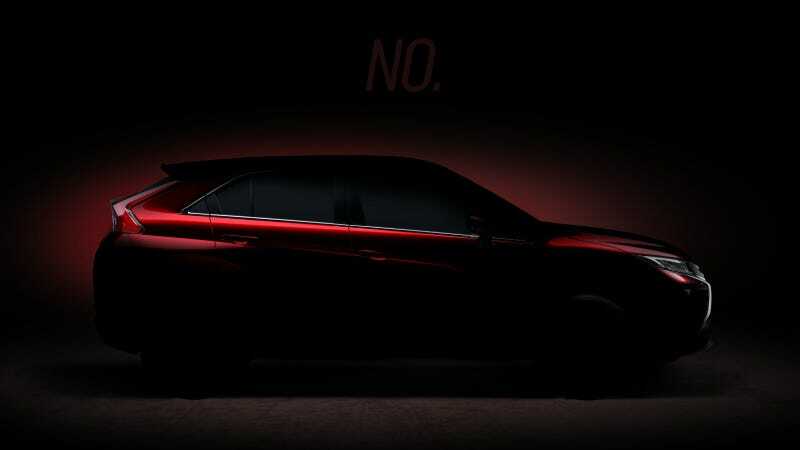 We’ll see if the world is truly an irredeemable place at the Geneva Motor Show, where Mitsubishi’s new crossover will be unveiled—and is hopefully called anything else. Living through the blobby, less powerful last-generation Eclipse was bad enough. Haven’t we suffered enough already? If “Lancer” ever comes back as any feckless crossover short of the Racing Lancer Mitsubishi used to race in Dakar, you’re dead to me, Mitsubishi. Don’t even think about it. There is no trudging over wet sand when you kill off Ralliart.